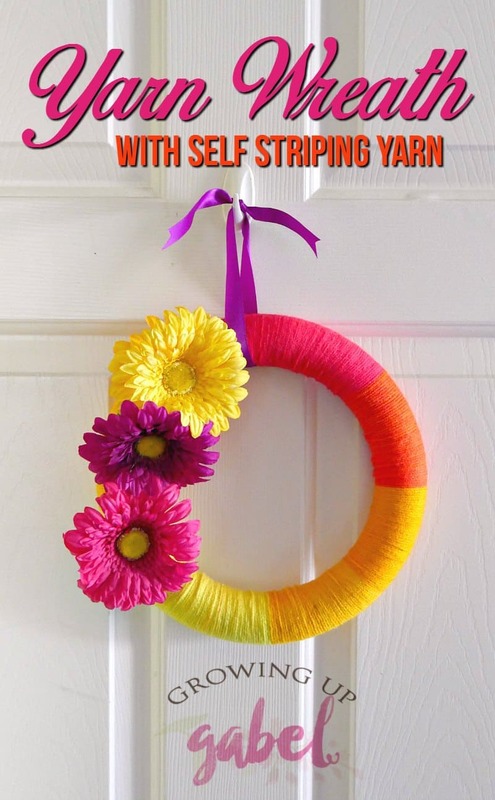 Use Red Heart self striping yarn to make a colorful yarn wreath! 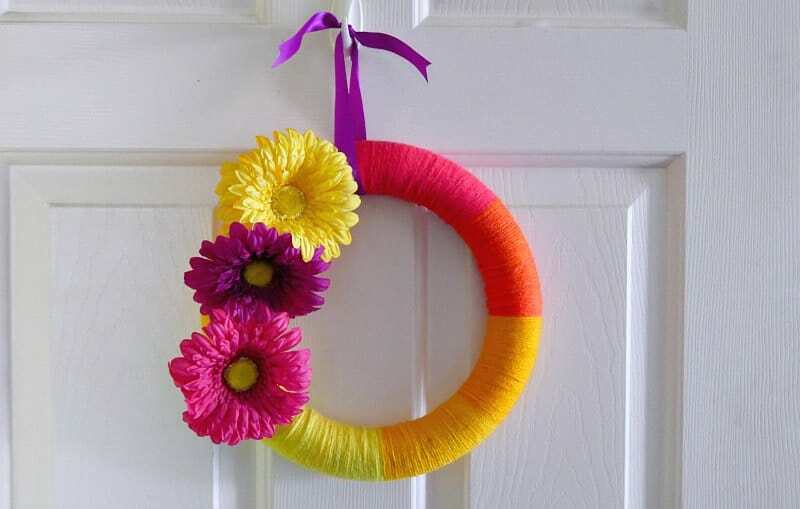 Add flowers for decoration and a ribbon for hanging. 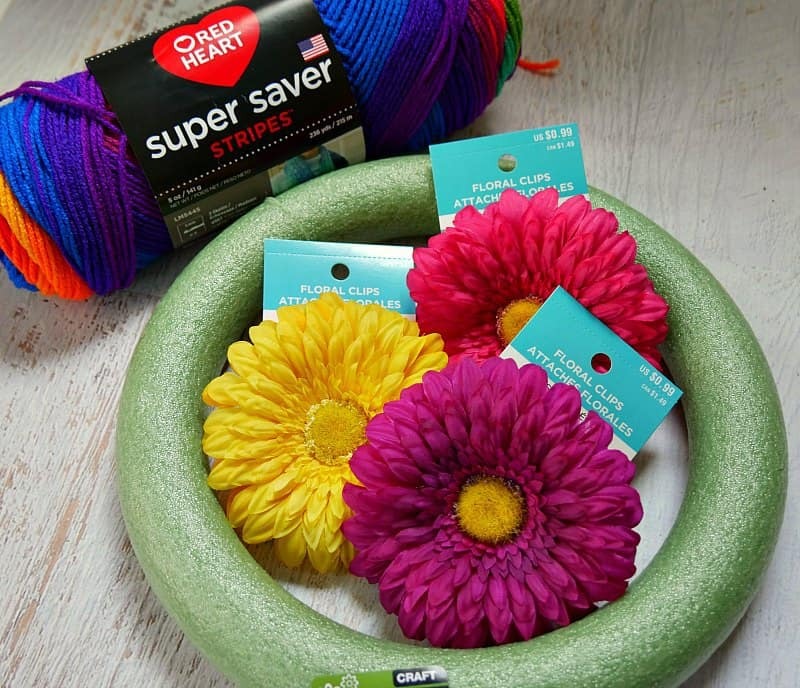 This easy and inexpensive craft is perfect for any season thanks to many self striping yarns. Self striping yarn is a bit of a wonder when knitting or crocheting. Thanks to a fun dying technique, different color stripes appear without having to break and change the yarn. I love knitting with self striping yarn, but have never used it in a craft project until Red Heart sent me a few skeins of striping yarn. We used an ombre yarn to make this fun Yarn Wrapped Mermaid Headband and I couldn't pass up trying to find a craft to use with the striping yarn. The trick is to find a project that is big enough so that the longer striping color changes will show in the finished project. 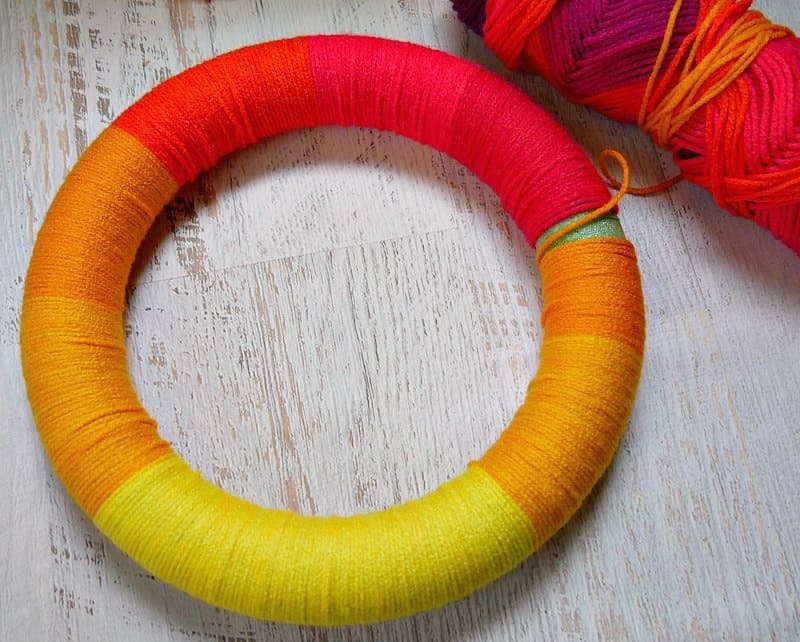 This colorful yarn wreath turned out to the perfect craft for self striping yarn. We used the Fruity Stripe Red Heart Stripe Yarn for this project. But there are 10 different stripe color patterns to choose from. Start at either end of the yarn skein. I like to work from the middle and pull out, but you can also work from the outside and wind around. Just start wrapping the yarn around the wreath form. Tuck in the beginning end of the yarn under the wraps. You can either lay each piece next to each other or overlap it a little. If you overlap, you'll get more stripes on the wreath. I laid the yarn next to each other on this wreath. When you get near back at the beginning where you started wrapping the yarn, add a dab or two of hot glue. 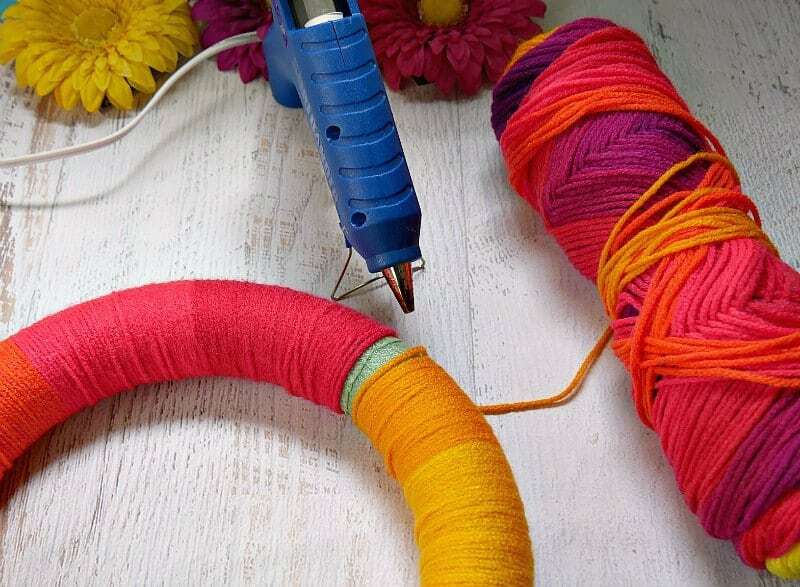 Wrap the remaining yarn over the glue. Trim the end. 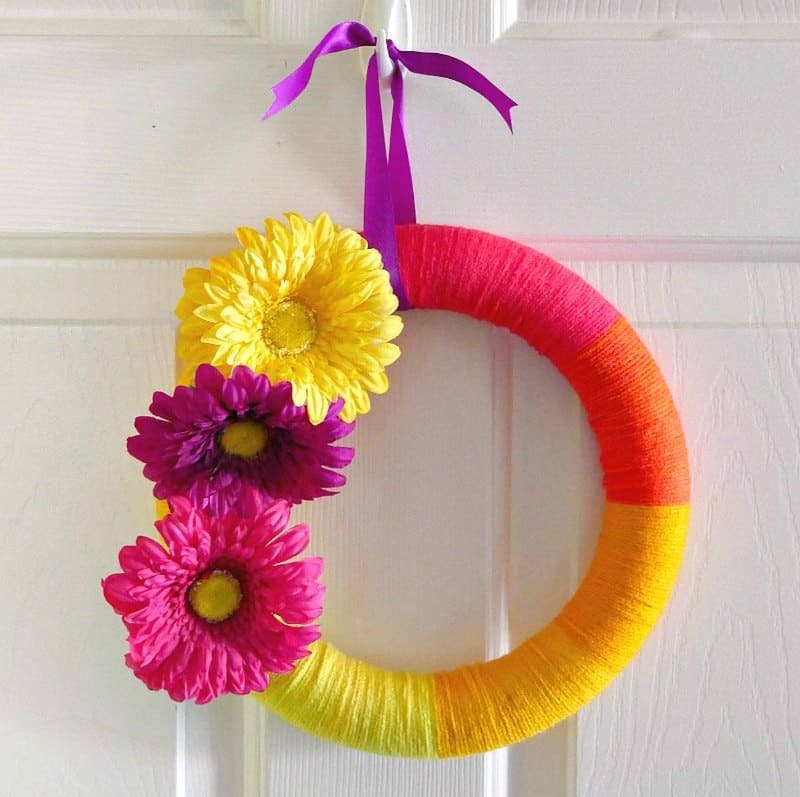 Use the hot glue to embellish the wreath. We used inexpensive silk flowers, but I really wanted some colorful popsicles! The Fruity Stripe yarn has a purple stripe in it that the yarn didn't get to when making the wreath. Instead, the orange repeated itself. So we covered the other orange stripe with the flowers. Add ribbon to use for hanging the wreath. I love how bright and sunny that is!! Thanks for sharing at #bloggerspotlight, pinned! This is adorable and looks so easy! I think I might give this a try this weekend, but maybe add so bright flip flops along with the flowers. Thank you for sharing!